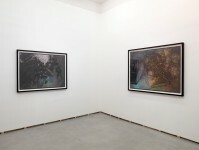 Federica Schiavo Gallery is pleased to announce the first solo exhibition in Italy of the American artist Jay Heikes. 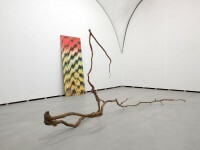 For this occasion, the exhibition titled Eroding Rainbow, the artist will present a series of recent works, executed in a variety of artistic media; painting, sculpture and photography, all of which create a greater installation representing yet another furher accomplishment in his artistic practice. 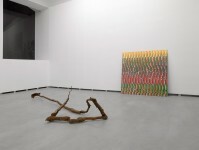 The use of contrasting materials and the attention towards the chromatic data are fused together in works that look like debris or finds in a total oeuvre, where - like in previous work by Heikes, - elements of pop culture and of celebrated modern and contemporary artistic experiences, are mixed and coexist giving birth to a new and unpredictable synthesis. 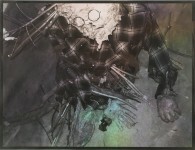 The photographic prints titled Civilians,balance, by way of Heikes' unique style, an image of American vernacular culture, horror movies and traces of reality. 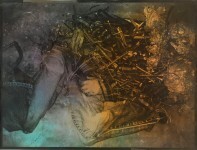 The artist's manipulations of colour on the prints add yet another level of interpretation and of visual esthetic. 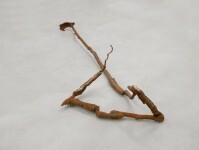 The sculptures Sinking Feeling, River's Edge and Dead Air, take us further into the understanding of the author's engagement with the materials and their metaphorical value. The ‘impossible league' of bronze and iron of these organic branch-like shapes underlines the bizarre coexistence of cultural and artistic references that despite themselves, come together in a unique form that appears absolutely natural and plausibile. The three panels, are a creation made in enamel on metal which oxidizes and results in the images' particolar and engaging colours. This not only remarks on the pictorial and chromatic sensibility of the artist, but also amplify, with their abstract forms, the lysergic and surreal world into which the viewer has entered. The young artist is known for his heterogeneous practice. He is capable of merging abstract painting, video, installation, ready-made, performance and sculpture with a common ironic approach, and a grotesque and amused mood that characterizes all of his work,. His works show the precarious nature of all references to the real, the continuous changes and shifts of all cultural, visual and experiential references. Jay Heiks was born in Princeton, New Jersey, in 1975. He works and lives in Minneapolis. His work has been exhibited at the Artist Space, New York, the Whitney Biennal in 2006, the ICA in Philadelphia, the Walker Art Center in Minneapolis, and at the Museum of Contemporary Art, Chicago.